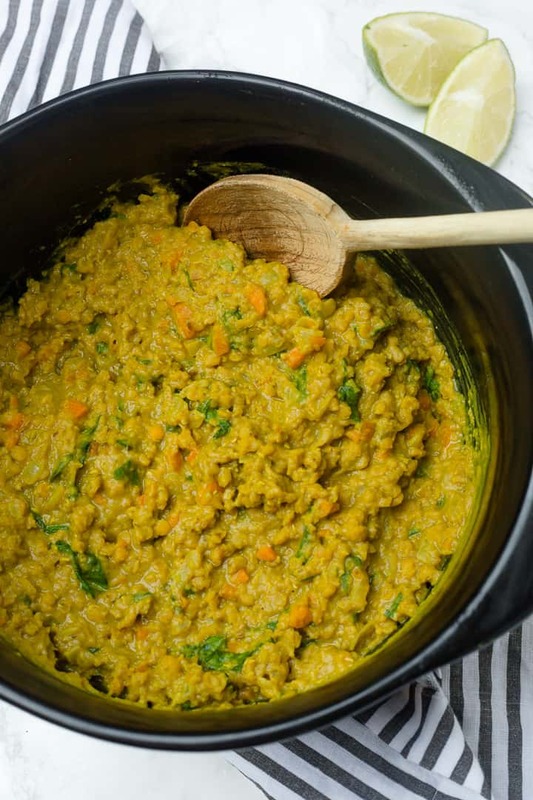 This red lentil dal is a delicious vegetarian (vegan!) dish made with red lentils, vegetables, and coconut milk for extra creaminess. Serve with cilantro lime rice for an easy, hearty meal that’s ready in 30 minutes! From what I can tell, the word “dal” means “a dish made with lentils,” so calling this “lentil dal” is a bit repetitive. But, that seems to be the name that Americans use to recognize this dish. 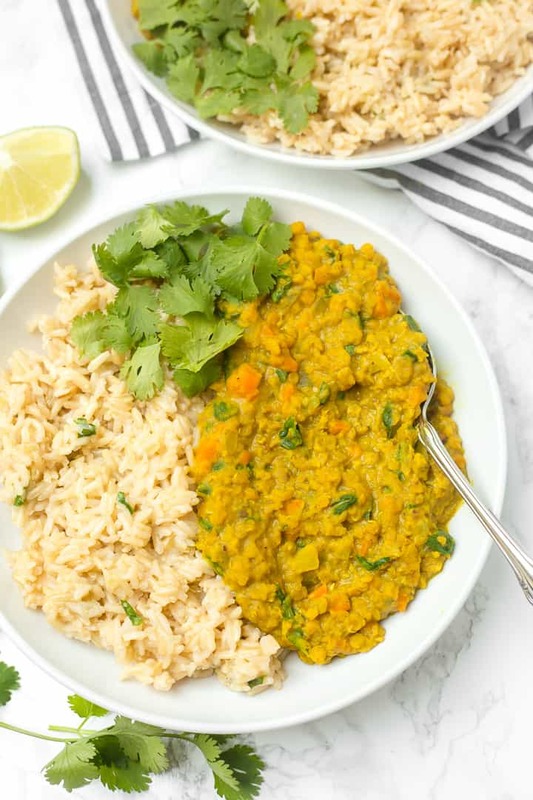 Whatever you call it– dal, lentil dal, or even just lentil stew– it’s delicious, hearty, and truly ready in only about 30 minutes. It starts with a base of sautéed carrots and onions. Then you just add your liquids (vegetable broth, coconut milk), lentils, and spices, bring the liquid to a boil, and then turn the heat down to lightly simmer. Stir toward the middle and end of the simmering period to make sure lentils don’t stick to the bottom of the pan. After only 15-20 minutes, you’ll have a pot of creamy lentils, and you can stir in some chopped spinach, which will quickly wilt. You can also add an extra splash or two of broth if you prefer less of a thick consistency. And that’s it for the lentil dal! 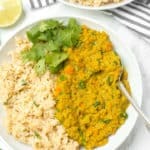 I think rice really makes a difference for a meal like this– you need something to go with that creamy lentil goodness! Right before I started sautéing vegetables for the lentil dal, I began cooking some brown rice since it takes slightly longer than the dal does to cook, and it’s all hands-off cooking. To make coconut cilantro lime rice, I add rice and water, plus a bit of coconut oil and a sprinkle of salt, to a rice cooker or medium/small pot. Cook according to package directions for stovetop rice, or rice cooker instructions. When the rice is ready, add a squeeze of lime juice and a small handful of chopped cilantro. That’s it! At some point, I want to organize all of my favorite tried-and-true recipes all in one place. 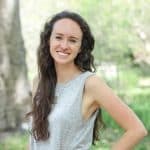 This blog is actually really helpful for that, but some of my favorite recipes aren’t on the blog, and I’d love to be able to quickly flip through all of my favorite recipes to get ideas for what to make for dinner. Does anyone have a good system for that? I like the idea of making a cookbook just for my own personal use, and to make it in a way that allows me to keep adding new recipes! Like this perfect dal– I’ve already made it twice, and it’ll definitely be a repeat dinner! 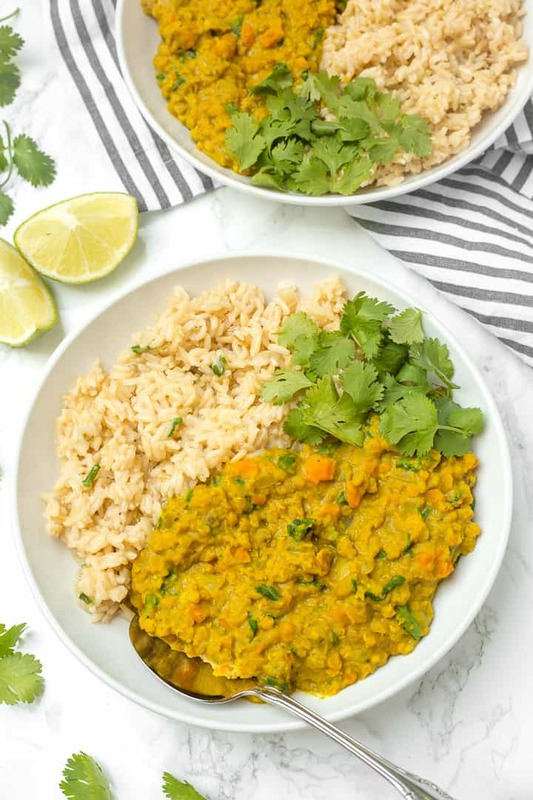 If you try out this red lentil dal, feel free to let me know in a comment or take a photo and tag me @livbane on Instagram! For this recipe, I used my 2.5 quart Xtrema ceramic Versa pot, which I love because it’s all-natural, non-toxic, and nonreactive. Xtrema cookware is also oven-safe and gorgeous, and I love having it in my kitchen! In a medium or large pot, saute diced onion and minced garlic in cooking oil over medium-low heat for 5-7 minutes, or until soft. Add the diced carrots, liquid (coconut milk and vegetable broth), spices (ginger, curry powder, cumin, salt and pepper) and lentils. Turn heat up to high and bring liquid to a boil. Once boiling, turn heat back to a slow simmer (about medium-low) and cook for 15-20 minutes, until lentils are soft. 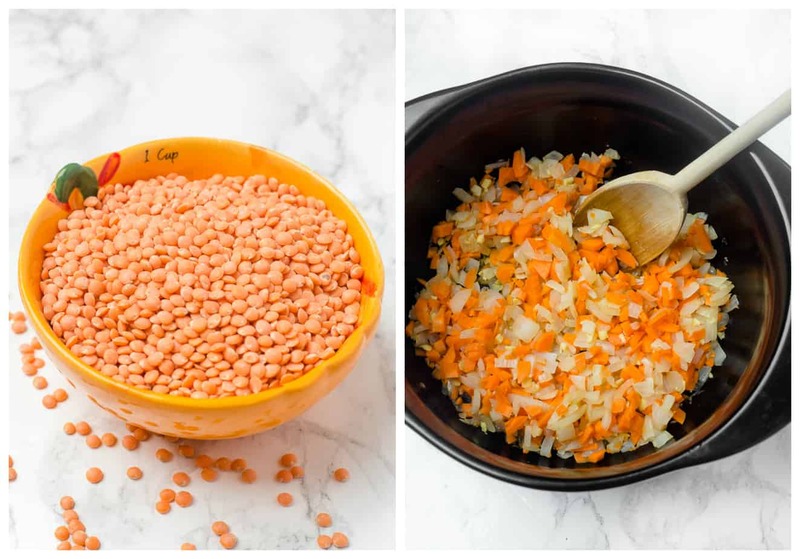 Stir every few minutes to make sure lentils don't stick, especially near the end of the cooking period. Add more broth if needed. Once lentils are soft, add fresh spinach and cayenne pepper, to taste, for some heat. Prepare rice according to package directions, adding coconut oil and salt at the beginning of the cooking process. Once rice is ready, stir in lime juice and chopped cilantro. **If making brown rice, start cooking the rice before the dal since it takes longer. Otherwise, start the dal first. Hamilton Beach provided me with a rice cooker for this post, and I’d love to send one to a reader! To enter this giveaway, just head to my Instagram profile and leave a comment on the lentil dal post there. *To participate in any promotion or program (including prize winners), you must be 18 years or older and reside in the 50 United States or D.C. Hamilton Beach is unable to ship to P.O. Boxes. You are getting more creative all the time. Could you put your recipes in a small three-ring binders? That’s a great idea! A 3-ring binder might be easy enough that I’d take the time to organize them that way! Anyway, I’d like to thank you for sharing this recipe. Can’t wait to try it. Awesome job! really it’s a great recipe.